Asian steam buns with ground pork/meat filling come with many names. 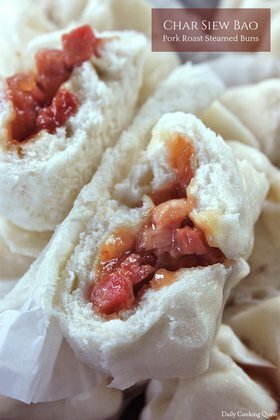 It is called rou bao (肉包) in Chinese, nikuman (肉まん) in Japanese, and in Indonesia where I grow up, we call it bak pao, derived from Chinese Hokkien dialect. 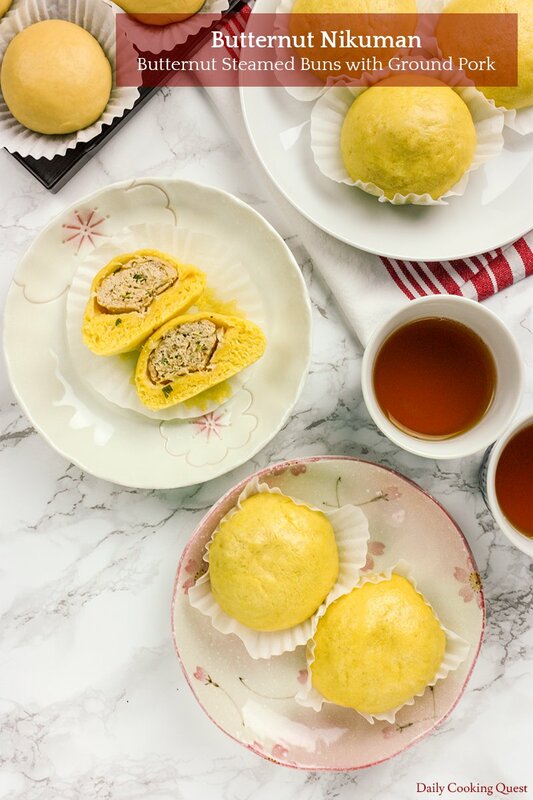 The most traditional meat to used in a nikuman is ground pork, but you can also make it with ground chicken, or for extra deluxe filling, a combination of ground pork/chicken and ground shrimp will make the steam bun even more delicious. Ground pork mixture for the nikuman filling. Since the dough will need to proof, it is best to knead the dough first. 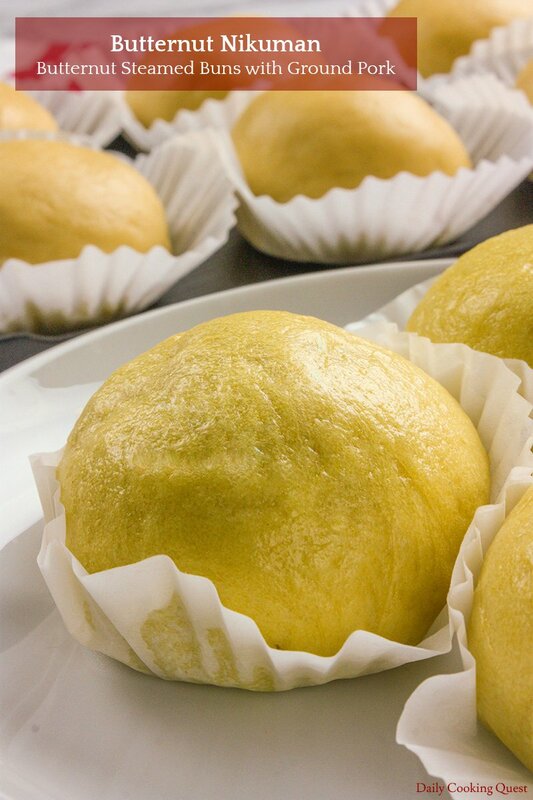 Steamed buns usually have snowy white skin, but you will need to make sure to use bleached all purpose flour and white color lard/shortening. I usually stock unbleached all purpose flour at home, so I know my skin will not be snow white, and I purposefully add butternut puree to my dough and make it bright yellow. You can also use pumpkin, kabocha, yam/orange sweet potato, purple sweet potato, or taro as puree and create colorful skin without any artificial coloring. I hand knead my dough, but you can use dough hook attachment, just make sure to knead until the dough is non-stick, soft, elastic, and smooth. With hands, this takes about 20 minutes. I am sure it will be faster with an electric mixer. Once the dough is kneaded, place it in a bowl and cover with saran/wet kitchen towel, and proof until the volume is doubled, about 1 hour. 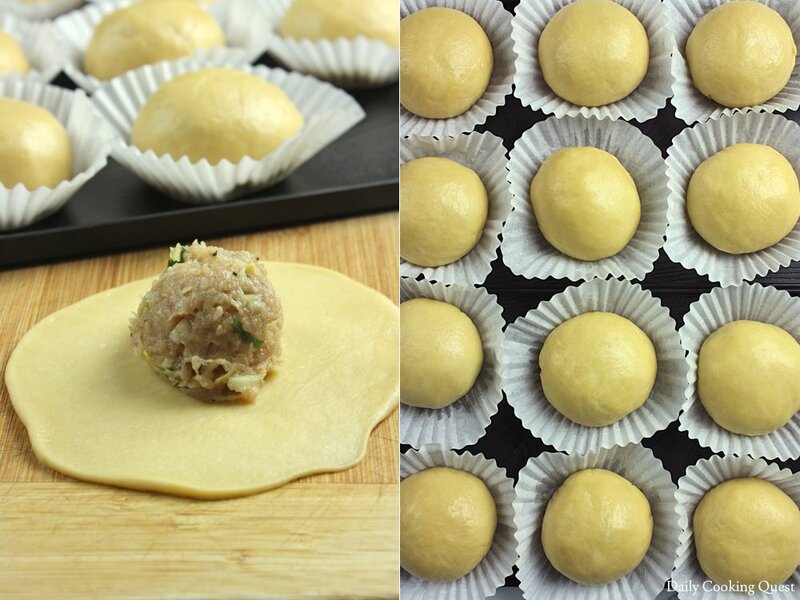 Place a meatball at the center of a flatten circle dough and wrap into a neat ball. Meanwhile, let’s make the filling. Just combine everything and let the filling chill in the fridge until the dough is ready. There shouldn’t be any standing liquid in the filling, so if you see that, add a bit of corn starch and stir again until there is no liquid. Once the dough has finished proofing, punch to release air bubbles, knead for a couple of minutes, and divide into 12 portions. Take the filling out from the fridge, and divide it also into 12 portions and gently roll each portion into a meat ball. With a rolling pin, flatten each piece of dough into a round circle, about 4 inch diameter, and place one meat ball at the center. Gather the edges, pinch together so the dough fully enclose the filling, gently roll into a round ball, and place on a cupcake liner. If you don’t have cupcake liners, you can also use parchment papers and cut into 3 inch squares to use as liner. 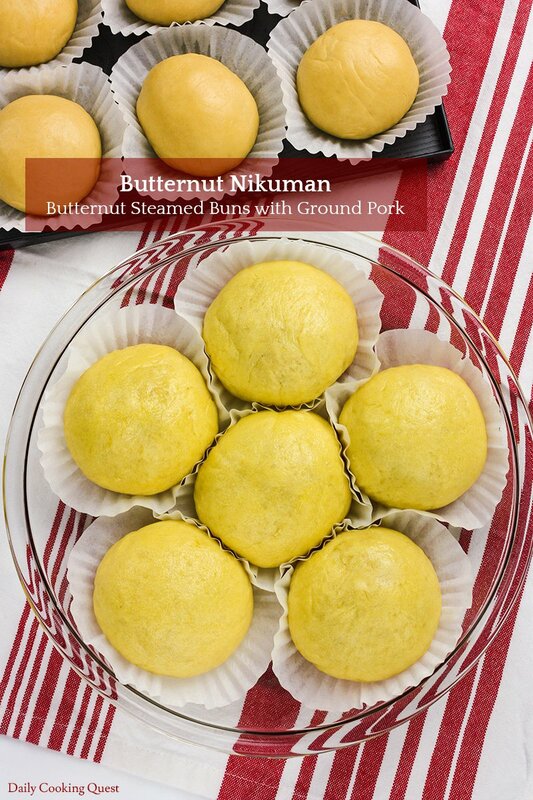 I know most people make pleats for nikuman, but I want to make this as beginner friendly as possible and simply make a smooth round bun with the filling enclosed. If you are highly experienced with pleating steamed buns, go ahead and make pretty pleats. You will need a steamer to steam the buns. A multi-tiered bamboo or stainless steel steamer is best since we are going to steam 12 buns. If you have a small size steamer, please make sure to steam in batches. The buns will expand slightly after being steamed, about 50% bigger, so make sure you don’t crowd the steamer so the buns have enough room to expand. If your rice cooker comes with a steamer rack insert, you can use that as well. If your house has no steamer at all, you can still make a make-shift steamer as long as you have a wok or a large skillet with a tight fitting lid. Place a small heat proof bowl/plate upside down in the wok/skillet, pour enough water to come almost come to the top of this small bowl/plate, place your buns on another bigger heat proof plate and place this plate gently on top of the small bowl/plate. You need to make sure the lid doesn’t touch the buns. With this configuration, you can steam the buns even without a dedicated steamer. Once the buns have been steamed for 15 minutes. Turn the heat off, but do not open the steamer lid. Let the buns sit in the steamer for another 5 minutes, then gently remove the lid, making sure no water drops on the buns since any water droplets will cause the skin to blemish. Steamed buns are best eaten straight out from the steamer. I love these for breakfast. For a bun of this size, one is enough for me, but my husband usually needs two ;) Store any leftover in a freezer friendly zip lock bags, they should last for at least a month in the freezer. Just reheat with a steamer or microwave for next time. Stir together warm water, active dry yeast, and sugar in a bowl. Let it rest for 20 minutes until foamy. Whisk together all purpose flour, sugar, and salt in a large mixing bowl. Make a well, then add the foamy yeast solution, butternut squash puree, and butter/shortening/lard/oil in the well. Knead the dough until non-sticky (you may need additional 1-2 tablespoon of all purpose flour if too sticky), soft, elastic, and smooth. Hand kneading will take about 20 minutes. Place the dough in the mixing bowl. Cover the bowl with a saran wrap/wet kitchen towel. Proof until the volume doubles, about 1 hour. Stir together all filling ingredients in a mixing bowl. If there is any standing liquid, add in more cornstarch and stir again. Chill the filling in the fridge. Prepare a large steamer on medium-high heat. Punch the dough to release air bubbles. Knead for 2 minutes, and divide the dough into 12 portions. 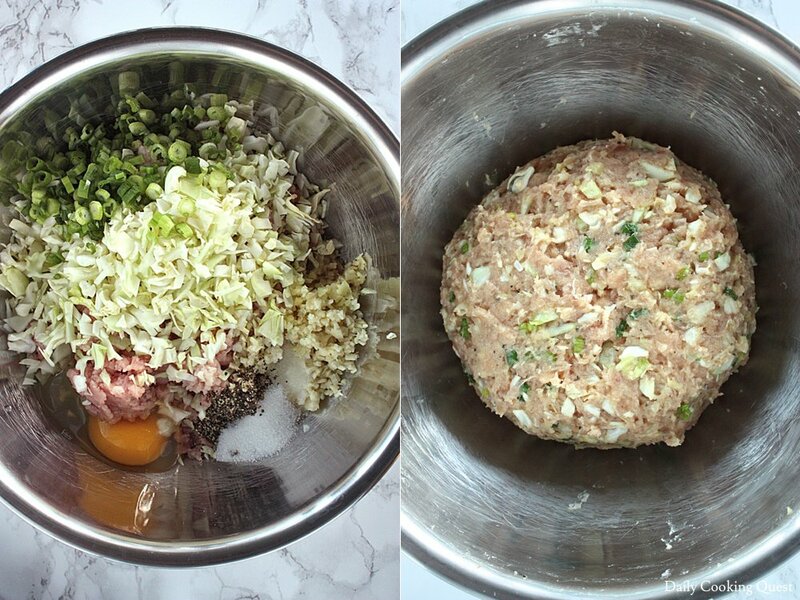 Take the filling out from the fridge, divide into 12 portions, shape each into a round meatball. Take a piece of dough, use a rolling pin to flatten into a flat circle about 4 inch diameter. Place one meat ball at the center of the dough. Gather the edges and wrap the meatball inside the dough. 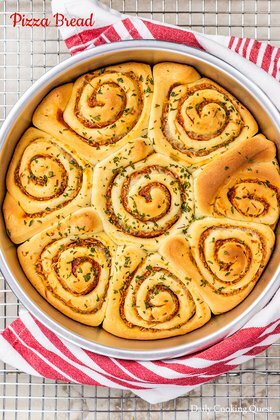 Gently roll the dough into a nice round ball. Line bun with cupcake liner or a 3" square parchment paper. Repeat for the other 11 portions. Steam the buns on medium-high heat for 15 minutes. Turn the heat off, and let the buns rest inside the steamer for another 5 minutes. 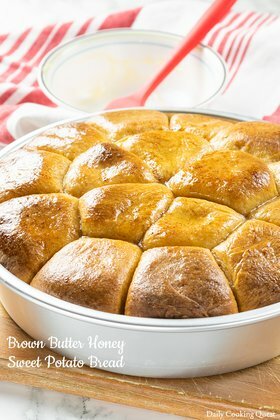 You may need to steam the buns in batches if you have a small steamer. Don't crowd the steamer since the buns will expand about 50% more in size after steaming. Gently remove the lid, making sure no water drops on the buns from the lid since this will cause the skin to blemish. Serve the steamed buns hot straight out from the steamer. This is really delicious with a cup of hot tea.